1. Player participation and entry fees are our main intended source of revenue. That assumption is based on a formula that is commonly used by most chess tournament organizers to determine success. However, MC is measuring success on our ability to solicit sponsors, negotiate broadcast rights, sell merchandise, rent vendor space, etc. That is where the real money is, not from players bankrolling the tournament. This means that orchestrating a memorable event is the first and foremost aim above all else. We want to create a “Wow!” factor that has folks begging for more. 2. Making money this year is the goal. Another false assumption. This first year is an investment year, as likely will be Year 2, and maybe even Year 3. The vision is for real returns to begin in Year 3-5, when more player entries will stabilize the expenses and the revenues mentioned above will (hopefully) kick in. 3. A million dollar “loss” in the first year is catastrophic. I guess this depends on how you view these things. When the game is being played for a multimillion-dollar return in the long run, some real seed money is needed in the short term. Even a three million dollar investment might not seem so serious if the big returns happen to come later. Everything depends on the capacity and patience of the investors. The bottom line comes down to an analysis of the long-term vision and the degree of tolerance for risk, which is totally in MC’s hands. Though none of us expects to see any financial gain in the near future, we are completely willing to embrace the challenge of monetizing our intellectual property and brand for the long-term. No successful enterprise should ever be looked at as a one-year proposition, and every big vision requires sacrifice. I’m happy to do my part in seeing this vision through, and I am thrilled to have a partner who feels exactly the same way. The savvy chess players who have already signed up are certainly happy that we are willing to shoulder the entire burden of the event, while they can come and play and enjoy themselves, and hopefully win substantial prizes. Their continued participation will go a long way to making the dream of chess as more than just a hobby in the United States a reality. For those who are worried about us, all I can say is to stop worrying. Come join us, and bring your friends. Leave your cares at home, and be a part of history in the making. 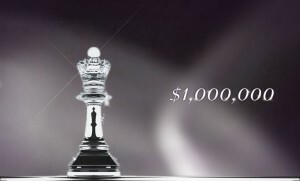 The Millionaire Chess Open will be a party to remember. Chess is going to the next level!